Image caption Tiger entered his plea at the Palm Beach County courthouse in Florida. Tiger Woods has been sentenced to a year's probation after pleading guilty to reckless driving. The professional golfer was arrested in May after officers found him slumped at the wheel of his parked Mercedes-Benz not far from his Florida home. A toxicology report found Woods had several legal medications in his system and marijuana's active ingredient. The 41-year-old golfer, who has 14 major men's golf titles, has not won a major championship since 2008. As part of Friday's plea bargain, he is required to attend a drug treatment programme and undergo drug testing. Woods has already completed 50 hours of community service as part of the programme, said a state prosecutor. If he completes the programme, the reckless driving charge will be wiped from his record, said Florida Circuit Judge Sandra Bosso-Pardo during his court hearing. "This particular plea agreement has no jail time," Judge Bosso-Pardo noted during the sentencing. "However, if you violate your probation in any significant way, I could revoke your probation and sentence you to jail for 90 days." "Is that understood?" she asked. 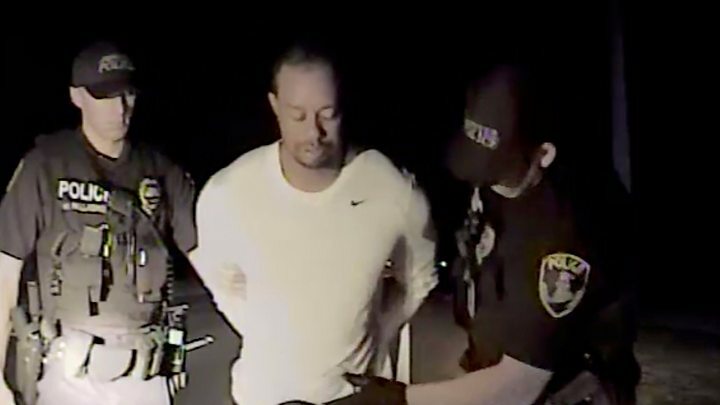 Police dashcam footage of Woods' 29 May arrest showed the golfer swaying and slurring his words as he interacted with officers near his home in Jupiter, Florida. He later insisted that alcohol was not a factor, which the toxicology test showed to be true. He claimed his disorientated condition was caused by an unexpected reaction to the combination of medications he was taking, following surgery on his back. In 2009 Woods was involved in a bizarre car crash outside his Orlando home. The incident sparked accusations of extramarital affairs which led to the end of his seven-year marriage and the loss of lucrative sponsorship deals.